KJ5107. Automatic locking and rope retaining pin, with 50mm gate opening. Durable, reliable and top-quality Karabiner for only £40.22. KD100/2/GR A small self retracting lifeline complete with a webbing lanyard. Lightweight and minimises fall distance in situations close to anchorage. Supplied with screwgate karabiner. Class-leading fall arrest equipment. KJ5108 Manual-locking karabiner hook with 20mm gate opening. Get yours today. 1013733 1-point duraflex harness. Titan lanyard c/w shock absorber and 50mm scaffold hook. Plastic carrying case. Fantastic value for money. 1 Point Harness Rear Anchorage. Shock Absorbing web lanyard c/w 19mm Karabiner and Delta Link. We stock these harness kits for a super-saving price. 1 Point Duraflex Harness, 2m elasticated lanyard. Complete with Backpack. Our best online price for this professional and comprehensive harness kit. Ready-to-use restraint work kit. 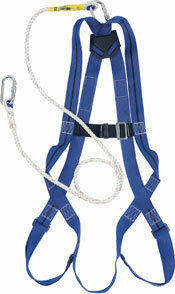 Full body with 2 fall arrest attachment points (rear-chest) 1.5m, 3-strand rope 12mm, 2 screw lock karabiners. Red drawstring bag. Titan 1-point harness with Scaffold Hook, rear anchorage. Lanyard c/w energy absorber and connector 18mm opening, length 2M (sewn direct to harness) Small plastic carry case. Don't miss this amazingly low price, order TODAY! 1013733 1-point duraflex harness. Titan lanyard c/w shock absorber and 50mm scaffold hook. Plastic carrying case. Ultra-savings at only £105.00 for this top quality and reliable harness kit. 1011897 An ideal solution for flat roof maintenance workers. Kit includes Titan 1-point harness, Titan 2m restraint lanyard with 2 screwgate karabiners. One of the best prices online for fall arrest equipment. If your working at height then our selection of Safety Helmets, Safety Harness, Lanyards, Fall Arrest Equipment and more can protect you against accidents or injuries that can happen when at work.